We are a family owned and operated business that has been serving Atlantic Canada for over four generations. Employment: We have open positions! CLICK HERE to apply! News & promotions - emailed to you! 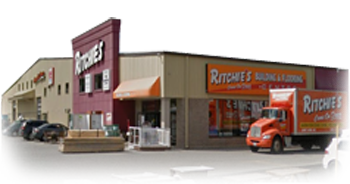 Ritchie’s is a family owned and operated business that has been serving Atlantic Canada for over four generations. John and Patricia Ritchie started the company in 1966. That same year his son Daryl and his wife Carol moved from Montreal and went into business with John in a small garage on Smythe Street. Initially stocking only wall paneling, paint, ceiling tile and ceramics. Over the next two years the business grew and was relocated to Rothesay Avenue in a warehouse across from Randy’s Restaurant, which is now, present day Dobson Chrysler. John who was known for always finding factory clear-outs and salvage goods, stocked the warehouse with tires, shoes, canned goods, furniture and whatever else he could buy at a deal. He also expanded his line of building supplies and after 3 years introduced carpet into his vast array of items available in his shop. In 1971, they built a new store at 715 Rothesay Avenue and still presently reside there. However on December 21, 1978, the warehouse caught fire and burned to the ground. With the help and dedication of his loyal employees within six months they had a new warehouse built and stocked it with the same quality lumber and building supplies as their competitors. The next few decades brought dramatic change. In 1981 Kevin Ritchie, Daryl’s son, graduated from the University of New Brunswick and decided he would like to open his own flooring business in Fredricton. He began small and rented a warehouse at Beaverbrook Court. A few years later, he moved to a larger warehouse on the Hanwell road, and expanded into the window and door business. That same year, Ritchie’s expanded into Moncton in the floor covering business, however under the recent ownership of Trevor and Adam Ritchie, John’s great grandchildren, they have expanded the business into specialization in Kitchens, as well as Bath fixtures and window coverings. Daryl Sr has since retired and handed the operation of the Saint John store over to his son Daryl Ritchie Jr, who with the help of his loyal employees continues to bring enthusiasm and perseverance to the table every day and is constantly evolving his business to further service the building needs of his community. Employees show their appreciation! What a great crew we have here, we are all one big family! This awesome truck gifted to Daryl by Steve Hawkins! Thanks Steve! Ritchie’s Building & Flooring Centre © 2016. All Rights Reserved.